Borders hockey’s 2nd XI tournament was held at Earlston High School with six schools taking part – a very good size of field for this age group. Section A comprised Earlston, Hawick and Peebles High Schools and was closely contested, but Peebles, with two 1-0 wins over their opponents, won the section. Hawick took the runners-up spot with a 1-0 win over Earlston. 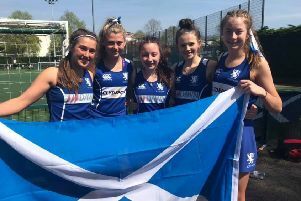 Selkirk, Kelso and Berwickshire High Schools fought out the other half of the draw and, with a goal apiece from Emma Mack and Shania Dalgleish against Selkirk, Kelso ran out 2-0 winners. They followed this with the same score line against Berwickshire to top the group. Goals in this game were scored by captain Flo Mace and Shania Dalgliesh. Selkirk then defeated Berwickshire HS 2-0 to earn a place in the semis against Peebles. With neither team able to put the ball away, the game resulted in a very exciting penalty shoot out. Abbie Forster from Selkirk and Kazya Stevens from Peebles both did a great job as stand-in goal keepers for the day and made it very difficult for the opposing strikers to score, meaning at the end of the allotted five penalties, it was a 1-1 draw. So to sudden death and, again, the first shots were saved. But, with a great strike from the top of the ‘D’, Peebles broke the deadlock to book their place in the final. The second semi between Kelso and Hawick was another good game but, with most of the pressure, Kelso scored the game’s only goal from a penalty corner. Emma Mack’s strike was expertly deflected into back of the goal by Holly Hay.